Students interested in learning more about the Truman Scholars Program and other prestigious awards should contact Megan Friddle in the National Scholarships and Fellowships Program. Chelsea Jackson, who has persistently advocated for a more equitable Emory campus and Atlanta community, has been named a 2017 Harry S. Truman Scholar. Only 61 other college students across the United States earned the highly competitive national honor, which is granted to exceptional students in their junior year who have demonstrated outstanding leadership, academic excellence and a commitment to a life of public service. Jackson, an Emory College of Arts and Sciences student double majoring in political science and African American studies, is Emory’s first Truman Scholar since 2011. As part of the award, which is administered by the Harry S. Truman Foundation, Jackson will receive $30,000 for graduate study as well as professional development for a career in public service. Jackson arrived at Emory from nearby Lithonia more than a little intimidated to be a public school kid in courses with peers who had personal tutors and private-school educations. 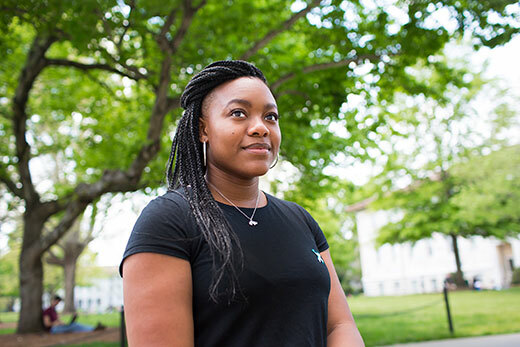 She was mentored by two seniors, Jovanna Jones and Samantha Scott, who not only assured her that she belonged at an elite liberal arts school but also that her arrival meant she had the capacity to mold the university and her education in her image. Her curiosity led Jackson to seek answers. She became involved in the Emory chapter of the NAACP and co-founded the Atlanta Black Students United, a group with black student representatives from every school in metro Atlanta. Jackson was part of the group that has since seen Emory hold two Racial Justice Retreats, to share ideas and take action on demands from the Black Students at Emory. She is most proud of her work helping to overhaul Emory's Bias Incident Reporting system to increase its transparency and require specific actions be taken. The system now requires that the team contact the person making the complaint, talking them through actions and involving them in the process. She continues to push for progress to diversify the faculty and curriculum. “Chelsea has the ability to raise the entire community’s consciousness with her leadership, and she deserves a lot of the credit for moving issues forward through a truly collaborative approach,” says Campus Life Dean Ajay Nair, who has worked closely with Jackson on the university’s Racial Justice Retreats, and the ongoing work to achieve measureable progress. “She has a level of creativity and curiosity that is remarkable,” Nair says. That curiosity and ability to analyze all sides of any given issue has made Jackson a standout in the classroom as well. More research is in Jackson’s future. Michael Leo Owens, associate professor of political science, saw Jackson’s leadership in his courses and her eagerness to go beyond required readings to understand concepts. He recently nominated her for the department’s honors program, and supported her pursuit of a BA/MA degree. When the Honors Admission Committee reviewed her file, members voted unanimously to make her the sole BA/MA candidate admitted, Owens says. Jackson already has her project lined up: Moving beyond questions of racial bias in prosecutors to see if a district attorney’s race itself affects pursuit of felonies over misdemeanors and other questions of prosecutorial discretion. Jackson describes herself as stubborn, with a specific future plan, but notes she is most successful when she’s challenged. She has long aspired to lead the U.S. Department of Justice as attorney general. She knows that nearly all of the nation’s attorneys general come from a prosecutorial background, but she remains firm that after law school, she will work as a civil rights and human rights attorney. She is also considering suggestions from professors to pursue a doctorate with her law degree, with an ultimate goal to become a Supreme Court justice. Jackson’s mentors react to such lofty goals with nods. Her activism and classroom excellence have led her to be accountable to her community and herself, and push her peers to do the same, they say.